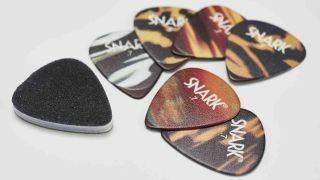 Surely, there can't be much left in the way of innovation when it comes to guitar picks, but tuner and metronome pro Snark says no with the launch of two "revolutionary" pick packs. Available in two brilliantly branded flavours - Sigmund Freud's Celluloids and Teddy's Neo Tortoise - Snark picks are apparently polished for 30 hours to eliminate the string drag that can occur when rough edges develop on regular picks, while each pack of 12 comes with a free file to customise the point and edge to your own plec spec. You could probably use it to polish your fingerpicking nails, too. As well as packing a non-slip grip, the picks are also made out of a "tone-enhancing substrate" - intriguing - with laser-cut precise sizes and shapes. Snark picks are available for £3.99 per pack of 12, with sizes ranging from .5mm, .7mm, .88mm and 1mm in Celluloids and .64mm, .78mm, .94mm and 1.07mm in the Neo Tortoise.